Evaluation version of the software will run for 60 days. After the evaluation period, some of the functionality will get disabled. You need to Purchase ( Register ) the software to make it fully functional. Once you purchased the software we will send you the registration name and key which will make the software fully functional after the evaluation period. Cost of the software is 200 USD. Purchase the software from the appropriate link below. • Configure the system using the powerful easy to use Setup wizards. • Automates sales transaction processing and service transaction start-to-finish. • Streamline inventory management and reporting. • Track customer information and maintain detailed customer histories. • Generate reports at the click of a mouse button. 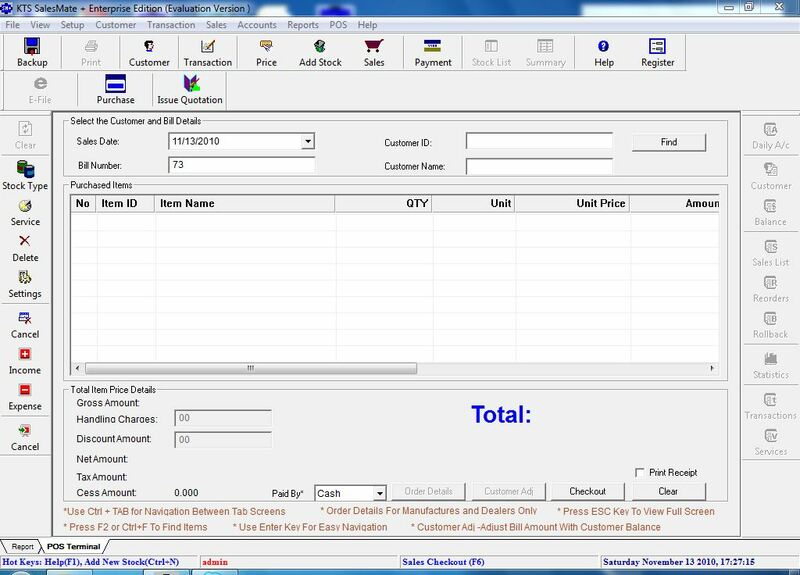 • Seamlessly integrate the POS hardware to the system. • Automatically take the backup of the data. • Customize the Screen and Keyboard shortcuts to suit your needs. • Extend SalesMate + features using various in house and third party Plugins. » SalesMate + Starter Edition is Free . » We charge only for Support and Enterprise versions of this software.